All that waiting is going to be so worth it. Disney-Pixar's Incredibles 2 is set to become Fandango's top animated pre-seller of all time, according to a report by Deadline. Industry tracking indicates that the film is currently beating out the advance ticket sales of 2016's Finding Dory at the same point in its lifecycle. The adorable aquatic sequel went on to become the highest-earning animated film of all time, taking in $486 million at the domestic box office to squash Shrek 2 ($441 million), The Lion King ($422 million), and Toy Story 3 ($415 million). Additionally, Incredibles 2 is out-pacing a number of live-action films, notably 2017's Wonder Woman and Spider-Man: Homecoming, as well as 2016's Suicide Squad. 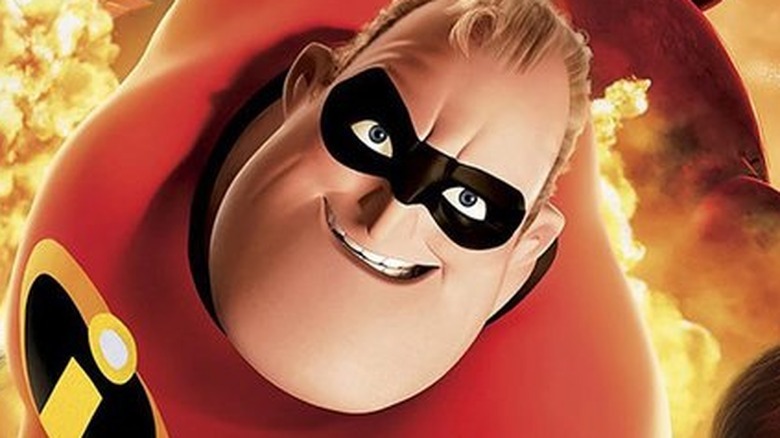 It's unknown exactly how much money Incredibles 2 has made in advance ticket sales, but the pic is expected to earn $140 million-plus in North America across its opening weekend and is looking pretty darn super-heroic ahead of its June 15 debut. As Fandango managing editor Erik Davis said in a statement (via Entertainment Weekly), "Fans have been waiting over a decade to see the return of Pixar's most beloved heroic family, and those years of anticipation are leading to record-breaking advance ticket sales for Incredibles 2. The film is already receiving terrific early buzz, and with summer vacation in full swing for many kids, Incredibles 2 is poised to become one of season's biggest hits." And Davis is right: Buzz around Incredibles 2 is near-deafening, since fans have waited 14 years to see the follow-up, and that kind of bigger-than-big hype is definitely pushing people to secure their tickets as soon as they can. Although advance ticket sales aren't a hard-and-fast indicator of how well a movie will perform upon launch (Solo: A Star Wars Story was besting Black Panther in its first 24 hours of pre-release ticket sales but turned out to be a big box office disappointment), early reactions to Incredibles 2 have been overwhelmingly positive and we'd be surprised if the flick doesn't live up to its expectations for success. Directed by Brad Bird, Incredibles 2 sees Elastigirl (Holly Hunter) take the lead as she protects the world from danger while Mr. Incredible (Craig T. Nelson) embraces his inner stay-at-home dad and helps raise Dash (Huck Milner), Violet (Sarah Vowell), and baby Jack-Jack. The Parr parents may have swapped superhero roles, but when a new supervillain comes to town, the entire clan must band together and fight as a family. Incredibles 2 is set for release on June 15.